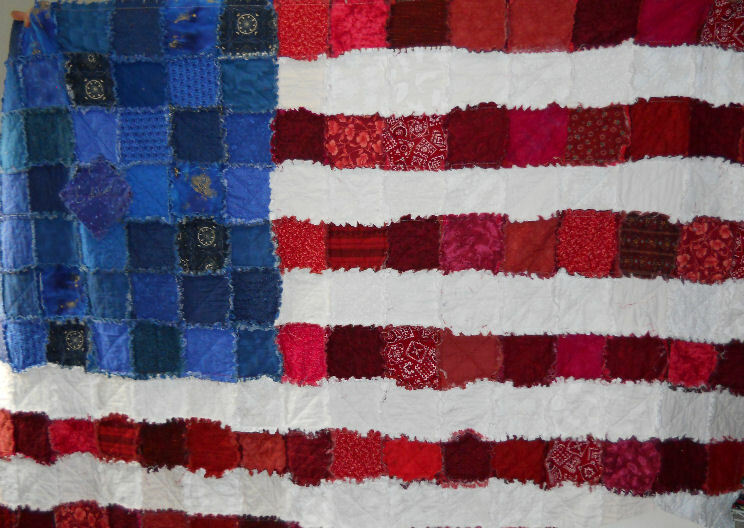 Recently some posted pic of a American flag quilt /wallhanging that looked like it was waving in the breeze. Will you please respond with pattern or pic. I think it was also in someone's avetar. Thanks! I did this one - http://www.englanddesign.com/pattern...ipes%20Pattern - and it turned out really well. Wow - there are so many cool flag designs!! It would be hard to pick just one. I knew that I as not "nuts". I just saw the avetar with the flag. It on Bellaboo"s I will pm her and may she will respond on this post so all can see!!! Opps sorry I see you found it. That is also a nice one! Keep those FREE patterns coming! I love FREE!!! I saw one and it was a kit from connecting threads. I think it was around 12.00 for the kit and it was small curved pieces. Go to Country Woman Magazine and it is there. Just downloaded it this morning. Look further down in today's linnks section at" American Flag pattern free". I really like your rag flag. Is there a pattern for it. Thanks. I want to insert a pic but don't know how. It tells me click: “insert image” icon on top of the message box. This icon looks like a framed picture of a tree. WHERE IS THIS?? My son just asked me to make him a ragged flag quilt. I saw a really nice one in pintest, all strips. hate the thought of cutting those little pieces. heberstitcher were you talking about the one that is a table runner or can be made into a flag or is there one I misseed? Here is the site with the pattern for the bargello flag. Thank you for these flags. I just seen a beautiful bargello flag and want to make the last link here. Thank you.